A Personal Account of a Young Woman's life with Autism. Kat was diagnosed with autism at age 2 1/2 in 1989. Today Kat is 24 years old. Her struggles and triumphs have impacted many people and especially her family and friends. We have created this page to share our story with everyone, with a hope that it will inspire others to help their child with autism. Today Kat is a young woman with autism who is continuing to learn and amaze us. She plays classical harp and piano by reading music and Celtic harp by ear. She takes dance classes and is able to audit classes at a community college. We recently added a video of Kat playing her Celtic harp for her teachers at the middle school that she attended when she was younger. There are many faces of autism and every person with autism is unique and so is their story. Kat's story has made us laugh and cry many many times and we hope that by reading her story you are able to cry a little and laugh a little and learn a lot from our successes and mistakes. We love feedback so please let us know how if you were touched in any way by Kat's Autism Story. 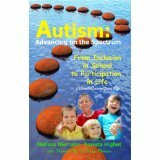 Autism: Advancing on the Spectrum is Now Available for Kindle! Our book is now available in Kindle format! A person with autism can learn and advance on the spectrum of abilities. Learn how you can help an individual with autism achieve their full potential. This quick read is full of life lessons learned from the journey with Katherine. This book will inspire anyone who wants to make a difference in the life of an individual on the autism spectrum. It was written by Kat's mom, Danuta Highet, and Melissa Niemann, who together assisted Katherine's inclusion during her scchool years. You don't want to miss out on this exciting and informative read. Kat continues to work hard on her on her language and communication skills. Here are language games designed for her. If you'd like to learn more about autism or have someone in your life on the spectrum, please check out our resource section for books, websites, and our first hand experiences. This web site is dedicated to capture the creativity and imagination of a person with autism. The individual with autism "Kat" who participates in selecting the topics for this site, loves music and entertainment. When she was younger she could not discriminate the concept of better or best. Instead she used the five star rating system that she observed in movie ratings, and applied it to everything in her life. Spaghetti is five stars. Horse radish? Zero stars! From video games to roller coasters, you can find a list of things that Kat has rated in the for kids section. If I were you, I'd trust this Disney expert's taste in movies. While touring with her message Katherine is sharing her story and helping others become Ambassadors for Abilities. 100% of the profits generated while touring and 50% of the profits generated through the internet sales will be used to fund the Movie about Kat. This will further help us promote the message of the possibilities that can be achieved when we work together. Currently, Kat is unable to edit and add content to this page. Directed by Kat, her friends and family add information to the site. The resources related to autism were collected by her family. Click here to learn more about us. Your comments and suggestions are greatly appreciated. We want this site to be your resource center and a great place to visit. We are raising funds for a documentary about Kat. Learn about how you can help!